A tribute to one of the greatest adverts of the game, here we celebrate Sir Tom’s life in a unique A to Z format to show how he has helped to shape a better city, club and game during his lifetime. Tom describes his dad as: “The biggest single influence on my life and the one to whom I owe a debt of gratitude beyond words. Not just for the interest he showed in my football… but for keeping our family together when hardship and tragedy threatened to break us apart.” Alf brought the family up – Tom, brother Joe and sisters Madge, Peggy, Doris and Edith – after the death of their mum Margaret at just 32. “How Dad coped with the upset and the subsequent responsibility is still hard to contemplate”, he says in his autobiography. “He was my guard and my guide”. 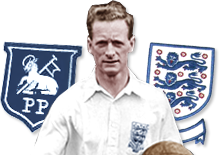 Tom made 76 appearances for England between September 1946 and October 1958. He also turned out for the Football League on 17 occasions. Long after he retired, Tom allowed some of his cap collection to be displayed in a glass case behind the bar of a pub named after him in Penwortham. Some were also loaned to the National Football Museum while it was sited at Deepdale. In his career Tom scored 210 times in 472 league and cup games for Preston. He reached double figures in ten of his 14 seasons with the club, his best being 1957/58 when he knocked in 26. At international level he put the ball in the net 30 times in his 76 England games, even though all-but three of his appearances were on the wing. He also scored seven times in 17 games for the Football League side. Injuries were a cross Tom had to bear as a marked man and he never completed a season as an ever-present. Invariably he tried to soldier on for the sake of PNE, knowing his absence would be sorely felt by both team-mates and supporters. “With the benefit of hindsight I was daft to be goaded into turning out unfit and having all those pain-killing injections,” he said, revealing a back problem very nearly ended his career in 1954/55. Tom’s older brother was also a promising player, but never made the grade as a professional. Instead he went into business with Tom outside football and the two of them founded the plumbing and electrical firm which was to bear the Finney name for decades. Joe played for Netherfield in the Lancashire Combination and trained with Blackburn Rovers’ juniors two nights a week. It was his presence at Blackburn which almost cost Preston their most famous player. Dad Alf suggested both brothers train with the same club. Just as Rovers were about to snap up the younger sibling, North End jumped in with a contract. Tom Finney became Sir Tom Finney in the 1998 New Year’s Honours List and not before time according to his legion of adoring fans. He joined Stan Matthews (1965), Alf Ramsey (1967), Matt Busby (1968) and Bobby Charlton (1994) in an exclusive club of footballing knights. It was Prime Minister Tony Blair who included Tom in his first Honours List, prompted by a petition by two 15-year-old Penwortham schoolgirls to ‘Make Him Sir Tom’ which also had the backing of the LEP. The investiture was at Buckingham Palace on 18th February 1998. Tom made his England debut at Windsor Park, Belfast in 1946 and scored in a 7-2 win. He also scored his last international goal at the same stadium in 1958, in total playing there four times for England and twice for the Football League – never finishing on the losing side. Just as memorable was the night he came out of retirement in 1963 to ‘guest’ for minnows Distillery in a European Cup tie against giants Benfica. He helped the Northern Ireland side to an heroic 3-3 draw against Eusebio and Co. He couldn’t play in the second leg in Lisbon and Distillery went down 5-0. Tom was renowned as a right-winger and that was the position he preferred for both club and country. But in fact he played almost as many games on the left for England (33) as he did on the right (40), with his other three coming as centre forward. The Preston magician always had to surrender the No.7 shirt to Stan Matthews whenever the two played in the same team. It was no problem for Tom, being naturally left-footed. In fact he scored 17 goals while at outside left – including four against Portugal in Lisbon – compared with 12 on the other flank. Tom played in three World Cups – Brazil 1950, Switzerland 1954 and Sweden 1958 – but England failed to make an impression in any of them. In 1950 Tom played in the embarrassing 1-0 defeat to the USA and, coupled with a 1-0 reverse against Spain, England were eliminated at the group stage. In 1954 the side reached the quarter-finals after drawing with Belgium and beating hosts Switzerland, but they were beaten 4-2 by Uruguay. In Sweden, Tom scored a penalty in the opening 2-2 draw with the Soviet Union, but did not play in the remaining two group games against Brazil and Austria, or the group play-off against the Soviets. Throughout his career Tom was a target for brutal defenders desperate to stop him at all costs. He made mugs of so many full backs with his dazzling footwork that the only way they could get even was to kick him. Tom bravely battled on, often playing when he really should have rested his battered and bruised legs. He lost count of the pain-killing injections he had to turn out on a Saturday afternoon. When he couldn’t make it North End used to delay announcing the team until minutes before kick-off, thus ensuring fans had paid and were already inside Deepdale before his absence was revealed. On paper 1954 should have been Tom’s finest in football, yet in reality it fell well short. He was named Footballer of the Year, captained North End to the FA Cup Final, went to the World Cup in Switzerland, starred in a famous win over Scotland in front of 134,000 at Hampden Park and won his 50th England cap. Yet he said: “It would be churlish to moan and groan after all that happened to me in that momentous year, but some of the events that promised so much failed to deliver.” Preston lost at Wembley, Tom had a stinker, England under-achieved in the World Cup and he struggled all season with injuries. Tom was born on April 5th, 1922, under the star sign Aries the ram. Many famous sports people are born under this sign. Aries is regarded as the most physical sign and it is also one of the most highly charged masculine energy signs in astrology, full of boundless vitality. Interestingly Arians are very compatible with people born under the sign Aquarius. And in Tom’s case that meant he was a perfect fit with that other wizard of dribble, Stan Matthews. According to astrologers, Stan, born on February 1st, had a great degree of compatibility with Tom, sharing many of the same personality traits.